Rosetta is a robotic spacelab that was launched by the European Space agency in March 2004 with an exceptional mission and that mission was to study the comet 67P/Churyumov-Geraskimenko as it goes from a frozen piece of ice and rock, into a sun-warmed dynamo discharging jets of dust and gas into a huge tail. And now, the transformation has begun. Claudia Alexander, project researcher for the U.S. Rosetta Project at NASA’s Jet Propulsion Laboratory, in a NASA press release, said. "Comet 67P is coming alive. And it is even more active than I expected.” Rosetta finished the past few years in hibernation, and was reacquired in January 2014 when her target was in site. 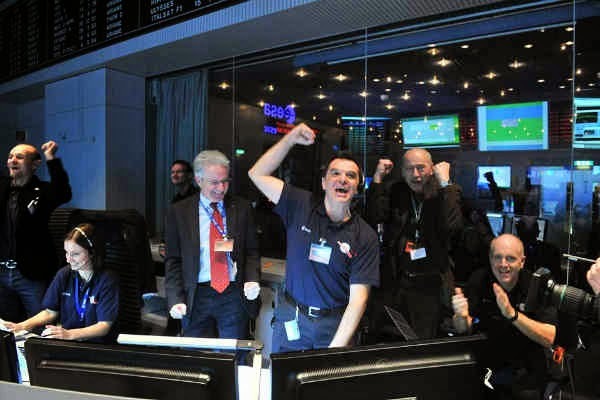 The image above shows tremendously cheerful scientists cheering as the spacecraft magnificently woke up from 957 days of hibernation, earlier to that point, they had no sign whether the spacecraft would still be useful. At the time, her objective, Comet 67P, viewed like a tiny pinhole drifting through space. But over the past month, a perky cloud has appeared round the nucleus, the start of the procedure that will end in the comment evolving a wonderful tail. Rosetta is programmed to come in line with the comet in August to observe the variations. Holger Sierks of the Max Planck Institute for Solar System Research,located in Germany where Rosetta's OSIRIS science camera was manufactured, said "It's beginning to look like a real comet. It is hard to believe that only a few months from now, Rosetta will be deep inside this cloud of dust and en route to the origin of the comet’s activity." Spacelab have flown by comets before, but this is the first time a spacecraft will circle a comet for 17 months, letting scientists to lookout in detail it as it progresses on its path to the Sun, and then back out again. A lander from the spacecraft is also planned to drop down on the comet in November, where it will observe the comet’s nucleus closely while Rosetta monitors from above. We can’t wait to see what this important mission exposes. Watch this space.